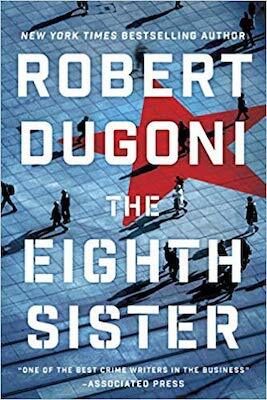 The following is an exclusive excerpt from The Eighth Sister, the first in a gripping new espionage series by Robert Dugoni. Charles Jenkins, a former CIA agent strapped for cash, takes on a risky mission: to infiltrate Russia’s secret service and track down an agent killing US spies in a cell called the Seven Sisters. A week after Thanksgiving, at 10:30 p.m., Jenkins boarded Aeroflot flight 2579 from Heathrow Airport to Sheremetyevo Airport, roughly twenty miles from the Moscow city center. Two days before, Jenkins had called LSR&C’s office in Moscow to advise that he would be flying in to evaluate their security measures. Though the flight was roughly four hours from Heathrow, the entire trip was seventeen hours from Seattle. With the layover and multiple time changes, he’d arrive in Moscow at five in the morning. To maintain his cover, Jenkins used the company credit card to arrange both the flight and his accommodations at the Metropol Hotel in downtown Moscow. He didn’t worry about Alex finding the charges; she rarely checked the company card since her preeclampsia diagnosis. Unable to sleep on the plane, Jenkins put on earphones and practiced his Russian and the Cyrillic alphabet. Though it had been decades since he’d last studied the language, he was still able to pull that knowledge from some recess in his mind. By the time the airplane’s wheels touched down, he was far from fluent, but he could understand and speak enough to get by. Jenkins looked out the plane window at a dark sky along the horizon and hoped it indicated snow in Moscow and was not a harbinger of things to come. Inside the terminal, the immigration official closely considered Jenkins’s passport, then turned to his computer terminal and typed. “Chto sluchilos’?” Jenkins asked. What’s the matter? The man looked surprised Jenkins spoke to him in Russian. “Nyet,” he said again and attempted to wave Jenkins out of line. “Ya prozhdal chas,” Jenkins said. “I u menya yest’ delo, po kotoromu mne nuzhno popast’ v Moskvu.” I’ve waited an hour, and I have business I need to get to in Moscow. Figuring that arguing was not going to speed up the process, and knowing that when things go bad in Russia they can quickly go very bad, Jenkins followed the man through the airport to a general detention room, certain he was about to be processed and put on a plane back to the United States. The man in the suit left him in the room alone. Jenkins set down his backpack and his roller bag. He tried the door. Locked. After thirty minutes, Jenkins tired of the game. About to bang on the door, he heard men’s voices just before the door burst inward and a man with a shaved head and broad shoulders entered and approached Jenkins as though he’d found a long-lost cousin. The man in the drab suit entered the room looking pale and worried. “No,” Jenkins said, following Uri out of the room. Jenkins might now be a United States businessman, but years earlier he had been CIA, and Russian memories, like their winters, were very long. It was all very plausible, and Uri a convincing actor. His presence at the airport could have been to pick up his boss—but Jenkins also knew that his passport had triggered an alarm. His detention had provided the immigration official an opportunity to alert the FSB, and gave them time to get people in place to shadow Jenkins’s movement while in the country. One of those people could very well be Uri. It was not uncommon for the Russians to put KGB, and now FSB officers inside American companies. Once in Moscow, Uri looped around the Kremlin on Marx Prospekt, giving Jenkins the chance to see the onion-shaped, colorful domes of St. Basil’s Cathedral. A few people milled about the square, braving the cold in warm winter clothing. Uri drove to the front entrance of the Metropol Hotel, and Jenkins stepped from the back of the car into a biting cold that stung his cheeks and hands and made it hurt to breathe. He’d packed a knit hat and gloves in the outer compartment of his bag, but instead of removing them, he took the moment to play tourist. He looked across the heavily trafficked road as if to admire the Kremlin’s clock tower, but focused his attention on the two men in the black Mercedes Geländewagen. He’d first noticed the car in the side mirror on the drive into the city. Jenkins thanked him, picked up his bag, and climbed the steps. A valet opened the door to a marbled hotel interior. Ornate, beaded chandeliers hung from a boxed ceiling above gold statues and marble pillars. Expensive watches glistened in lobby display cases, and a harpist plucked the strings of her instrument. The clerk at reception spoke perfect English, and within minutes Jenkins entered his fifth-floor room. He had to fight the urge to lie down on the king-sized bed, knowing that if he slept, it would be “too deeply” as Uri had warned. Jenkins had work to do. He walked into the bathroom, shut the door, and turned on the shower. Then he reached behind the toilet and felt the duct tape. Peeling free the tape, he pulled out a manila envelope. He sat on top of the toilet lid, opened the envelope, and removed several sheets of paper, reading the name of the inactive operation and the identity of the Russian double agent he would use to get the FSB’s attention. Jenkins had the bait. Now he had to cast his line and hope for a strike. From THE EIGHTH SISTER. Used with the permission of the publisher, Thomas & Mercer. Copyright © 2019 by Robert Dugoni.